Let's be real for a minute! Arizona is a DRY and HOT state. With that being the case, if you haven't noticed most homes and businesses avoid grass or water demanding yards and lean towards hardscape design. We don't blame them either. With a professional hardscape landscaper, you can still have a beautiful yards that looks just as good if not better than a lush one! There are many options and style you can choose from when designing your hardscape landscaping here in Arizona. We give the largest and most diverse selection for all our clients and can create any harsdscape design you can imagine! With Red Mountain Landscaping, the sky's the limit! So give us a call or request a free estimate today! Looking for a way to wow your family, friends and guests? Arizona Pavers are the perfect solution! They look so much better than standard concrete pathways and patio and they can be fully customized with colors, styles and designs! They truly are the perfect element to add to your landscaping projects - either hardscapes or lush green landscapes! When it comes to pavers, we will discuss exactly what your looking to enhance. In most cases this is either patios, walkways or driveways. If you already have existing cement patios, walkways or driveways - we have the manpower and tool to remove all the old cement and properly and professionally install your new selected pavers! So what's the paving process? It's quite simple. You choose from out portfolio or something you may have even found online or at a store and we will order, deliver and install the pavers. (in most cases this is either brick or stone). 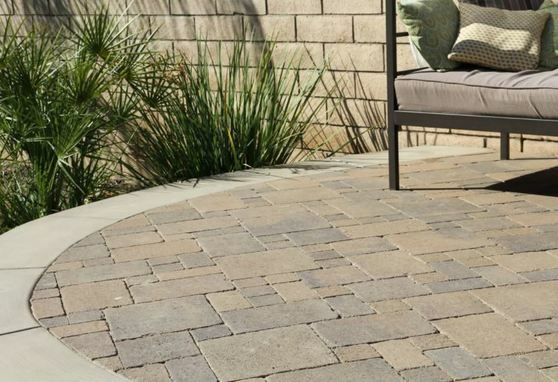 At that point we will be sure to properly prepare the ground with a flat base, dirt, sand and all the necessary precautions to keep your patio lasting for the life of your house! 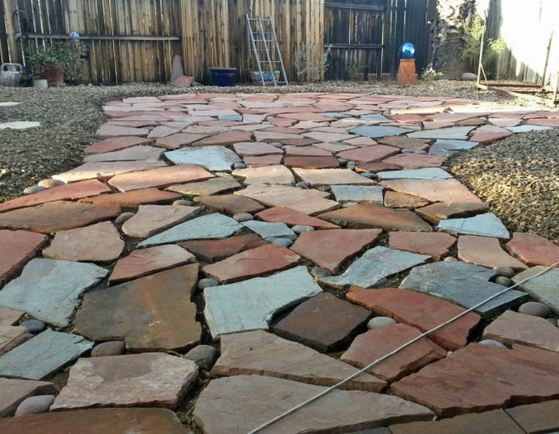 Even if your landscaping is already done and the last element you would like to add is pavers - give Red Mountain a call and request a free on-site estimate! Looking for a way to make your landscaping pop? Or maybe there are certain levels on your property that needs to be elevated and retained by a stunning wall! We can help! Red Mountain Landscaping is the leading expert in retaining wall design and installation. When it comes to quality work, affordable pricing no one does it better than us! How do you know if you need a retaining wall? Well in some cases, depending on the property type we may recommend it based on the land we are working with or perimeters in which your yard extends. 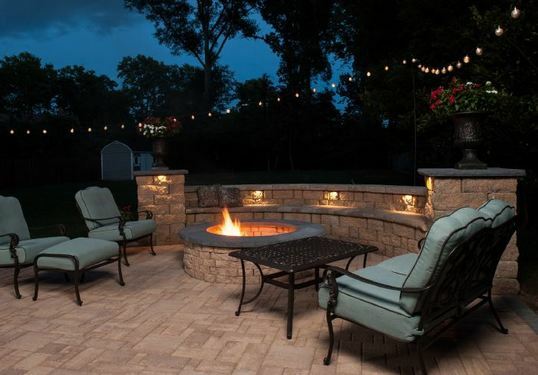 In other cases its just a beautiful way to make your landscape really pop by adding a stunning wall that showcases your plants, trees, water pieces or whatever you can envision. Retaining walls can also serve a purpose in preventing water reaching certain areas and holding back extra dirt or plants in areas where we wouldn't be able to do so with out a retaining wall. 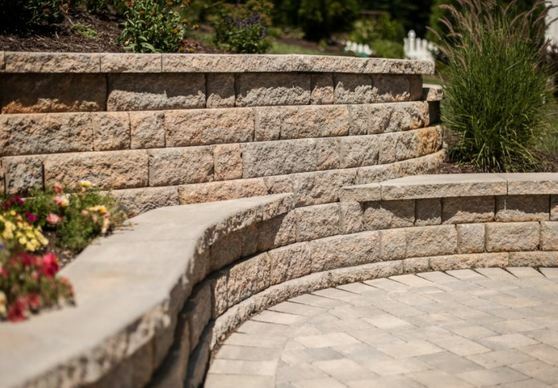 Retaining walls also come in many diverse styles and selections to choose from. When we visit you for a free on-site estimate we can go over colors, styles, textures, materials and every detail on how you want your retaining wall to look! Give us a call or submit a request online today! Looking for that perfect fireplace that blends just right with your newly or existing backyard or patio design? We know exactly what your looking for. We have designed hundred of custom fireplaces for every type of landscape design in Arizona. They also go perfect with hardscape landscape designs out here in the valley! So what kind of fireplaces do we offer you might be asking? Well, every thing we build is custom made - so whether you saw something in a magazine, online or maybe just on TV - let us know what your envisioning and we will create it. We work with all stone and brick types, custom cutting everything to your liking. We also can have it be a free standing fire place or against a wall. The fireplace itself can then be fueled either by wood only or we can lay the lines to have the fire place be gas ready so you never have to use wood at all! Whatever you decide to do you can be sure we will perform well beyond your expectations and the best part is you'll be able to enjoy your new fire place with all your family and friends for the years to come. Nothing beats sitting around a nice campfire at night in the beautiful Arizona weather enjoying company and eating s'mores! Just imagine that! Call us or request a free on-site estimate today! With brick, there are so many awesome options in creating centerpieces for your landscaping project. With brick we can create accent walls, walkways and patio areas. Brick just like pavers comes in different styles and installation options. When we use brick we make sure it will fit the design and theme of your hardscape project. 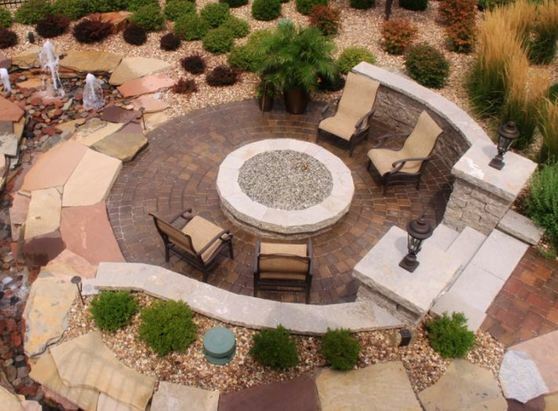 We carefully cut and precisely lay every brick to perfections insuring you the most beautiful landscape designs. 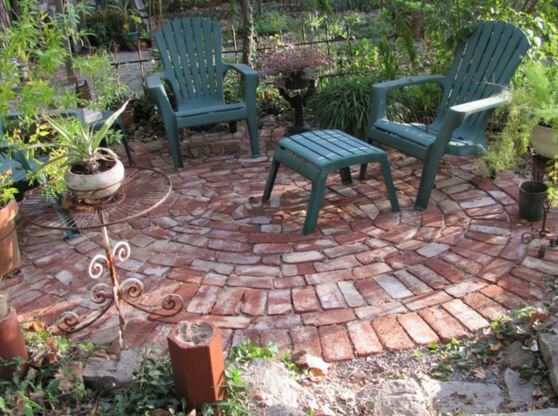 Popular brick projects we have done in the past involve pathways, fireplace and patios. The sky is the limit and the nice thing is brick is relatively affordable compared to other landscaping materials. Trust us when we say no one does better landscaping and hardscaping brick work than Red Mountain Landscaping. Your Arizona Landscape Professionals! Call today or request a free estimate online! The beauty of cement is that it can be shaped and designed however you want it. All we have to do is mix it and either poor it in the proper retainers or special design areas to set. When it comes to landscaping with cement, your landscape ideas can come to life! We can help create a perfect cement patio or pathways. Solid, pieced or even cobbled stone. We can also build other center points with cement. usually fireplaces or water structures in the yard or property. The point is we know how to work with cement. We are Arizona best landscaping cement contractors. Let us know what you want to create and we will do our absolute best to create it! So where do you go from here? Simple! Give us a call or request a free estimate online. We will schedule a on-site visit and give you an exact quote and timeline on when your project can become a reality! 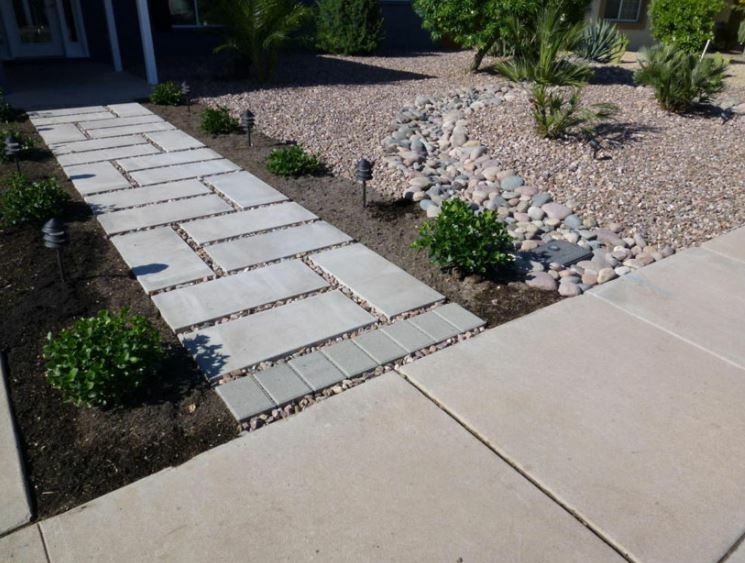 When it comes to Landscaping Walkways or Paths in Arizona, well we are the go to experts! We specialize in every type of walkway and pathway design for your landscaping projects. We are able to acquire any design you can imagine and help lay the foundation of your beautiful path to set the tone of the surrounding landscape. A popular choice for pathways is broken stone which can be articulately laid to create a stunning path for your family and guests. It creates a elegant and unique feel to all those who visit your home or business. It doesn't end just there. We specialize in every walkways type, pacers, custom cement work or even just laid rocks. When you choose Red Mountain Landscaping, be prepared to be awe struck at our amazing design and installation process. We are sure to keep you as a satisfied client for life! Call us today or request a free on-site estimate! Are you looking to have your lawn pop? By having the appropriate and professional edging done it will! We specialize in giving lawns a perimeter that in most cases separates the grass from the plants, trees and garden areas. With our grass edging design you can choose from quite a few options to make your lawns look spectacular! 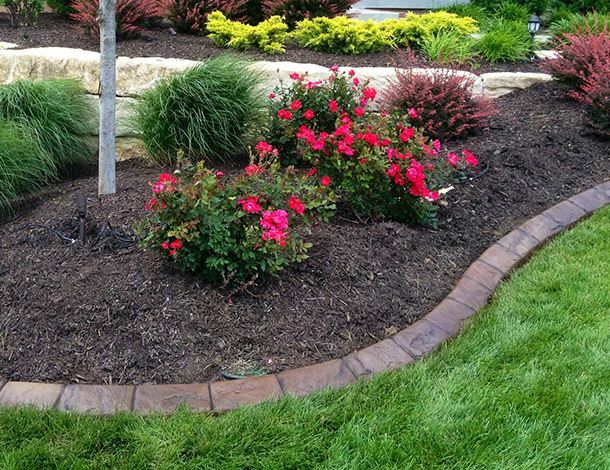 We offer cement edging, stone edging, brick edging, paver edging and even just standard rubber edgings. Whatever you decide to choose, they will all create a definitive split between your grass and flower beds. Wondering what style to choose? Or maybe you have a edging style already in mind! Let us take care of you from start to finish! Give us a call for a free on-site estimate and we assess your property, show you samples and give you an accurate quote! We look forward to hearing from you!